Neglecting to change the filters in your home's central heating and cooling systems creates a problem that might, at first glance, seem unrelated to the filter. As air gets sucked through gaps in the floorboards and baseboards, tiny dust particles can get lodged in the carpeting around the edges of the room and create noticeable black lines. Sometimes called filtration lines, they also occur along the bottom edges of closed doors, and they can be difficult to remove. 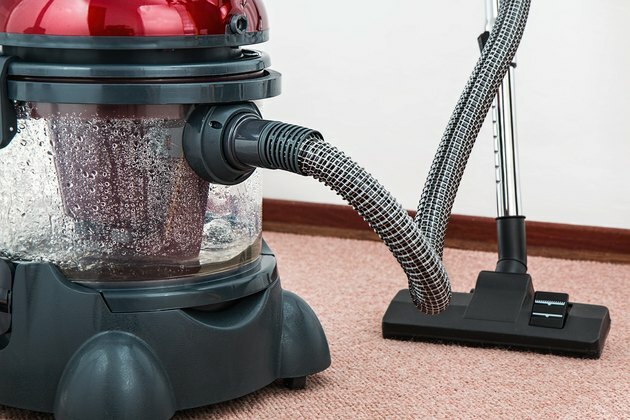 A vacuum may remove some of the discoloration, but the smallest particles are electrostatically bound to the carpet fibers. The key to cleaning these lines is to agitate the fibers by scrubbing or scraping to loosen the dirt particles. This makes it possible to clean them with water and an appropriate cleaning solution. It takes more than a vacuum to clean filtration soil on the edges of your carpet. Scrape away surface fibers by running a pull scraper or a hard-bristle scrub brush over the surface of the discolored part of the carpet. A pull scraper is the best tool for this job because it can reach close to the wall without causing any damage to the carpet. For this technique to be effective, it's important to do it before you get the carpet wet. Install the crevice tool on the end of your vacuum cleaner hose and vacuum the area you just scraped. You should see a noticeable improvement after you've scraped and vacuumed, but some of the discoloration will probably remain because it's caused by greases, oils and electrostatically bound particles deep in the nap. You will have to wash this away. Moisten a white rag with clean hot water and rub the carpet vigorously. It's important to use a white rag to avoid transferring any dyes to the carpet. If the carpet is sufficiently clean after wiping, your job is done. If not, it's time to call in the cavalry. Deep clean problem filtration lines with a carpet cleaning solution. You can choose one of several commercial carpet cleaners available at your local home improvement outlet or hardware store, or you can mix your own solution by adding a cup of white vinegar to a gallon of warm water. A solution of equal parts of water and hydrogen peroxide is also an effective cleaner. Test your solution on an inconspicuous part of the carpet to make sure it won't affect the color or damage the baseboards. Work the cleaning solution into the carpet with a scrub brush. It's important to agitate the carpet fibers to loosen the dirt particles so you can remove them. Spray clean water on the carpet, scrub lightly, then wipe or blot as much water off as possible. Let the carpet dry, then vacuum again to remove any surface dirt and loose fibers that remain. Filtration soil around the edges of the room is a fact of life in most homes with central air systems, but you can minimize it by cleaning your furnace air filters regularly or replacing them when they are dirty. Most HVAC pros recommend cleaning or replacing your filters once a year or every six months if you use the system for cooling as well as heating.